Gabrielle Giffords, who left Congress to focus on her recovery after being shot in the head, was honored with the John F. Kennedy Profile in Courage Award Sunday in Boston by Caroline Kennedy . 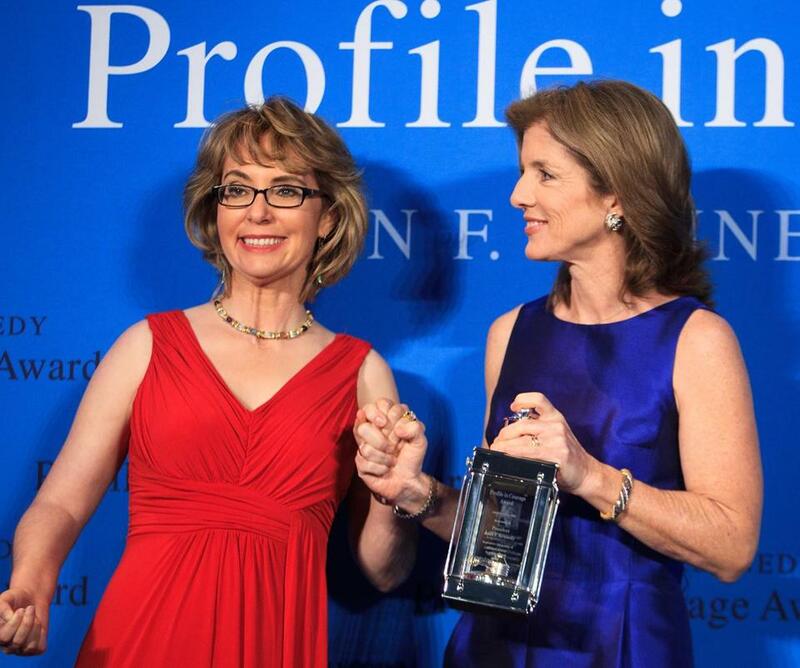 Former Arizona congresswoman Gabrielle Giffords, who survived a deadly shooting in Tucson in 2011 and has become a vocal advocate for legislation aimed at reducing gun violence, received the John F. Kennedy Profile in Courage Award at a ceremony in Boston Sunday afternoon. The award, given annually by the John F. Kennedy Library Foundation since 1990, was presented by the foundation’s president, Caroline Kennedy. 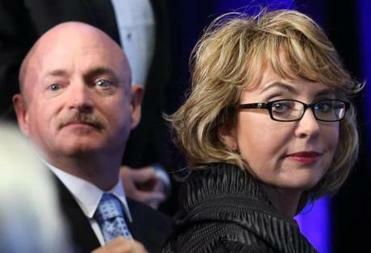 Giffords and her husband, Mark Kelly, at the ceremony. On Jan. 8, 2011, Giffords and 18 others were shot during a meeting she was holding with constituents in a supermarket parking lot in the Tucson area. Six people died, including Arizona District Court Chief Judge John Roll; Gabe Zimmerman, one of Giffords’s staff members; and 9-year-old Christina-Taylor Green. The shooter, Jared Lee Loughner, pleaded guilty to 19 counts, including attempted assassination of a member of Congress, in August 2012. He was sentenced to life in prison. Giffords had been announced as this year’s award winner in early March. But, after the April 15 attacks at the Boston Marathon, the ceremony took on added meaning. It was held inside the John F. Kennedy Presidential Library and Museum, a building that caught fire six minutes after a pair of bombs exploded at the Marathon finish line. Initially, some thought the library had also been bombed. Investigators later ruled it was a fire caused by carelessly disposed smoking materials. The building is in Dorchester, where 8-year-old Martin Richard, the youngest person killed in the Marathon bombings, lived. Giffords and her husband, retired Navy captain and astronaut Mark Kelly, also visited victims of the bombings at Spaulding Rehabilitation Hospital. Giffords was chosen for the award by a 13-member committee. The award ceremony also drew several high-profile members of Congress: Nancy Pelosi of California, the former House speaker; Ron Barber of Arizona, an aide to Giffords who was also wounded during the Tucson shooting and was elected to succeed Giffords after she stepped down to recover; Donna F. Edwards of Maryland, a member of the Profile in Courage Award Committee; and Debbie Wasserman Schultz of Florida. Matt Rocheleau can be reached at matthew.rocheleau@globe.com. Follow him on Twitter @mrochele. Globe correspondent Gal Tziperman Lotan contributed to this report.